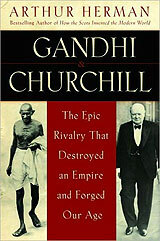 Book review: "Gandhi & Churchill: The Epic Rivalry that Destroyed an Empire and Forged Our Age"
This review first appeared in the June 29, 2008 issue of the North County Times. Arthur Herman's new dual biography of Mohandas Gandhi and Winston Churchill, and their fractious relationship over England's rule of India and its ultimate ending, is one of those old-fashioned in-depth (and hefty!) bios that history junkies just love. Herman draws on both men's own writings and speeches, and on correspondence and diaries of their associates, friends, families and adversaries, for a book that comes in at more than 500 pages. Well-written, minutely detailed and generally informative, "Gandhi & Churchill" flirts with being a great book, but ultimately settles for competence. The chief reason the book falls short of greatness is that Herman's main thrust is not historical, but psychological. He frames Churchill's refusal to accept a post-imperial future for the British nation as a response to a supposed lack of love from his father. Gandhi's reactions to unfolding events are always framed in what Herman presents as the Indian leader's fixation on his own inner moral ideals. Basing a biography on such unknowable intangibles leads to the reader wondering how many, if any, of the author's conclusions are accurate. It also leads to the unavoidable realization that while there's a chance Herman's assumptions about both men are accurate, it is at least as likely that he's completely wrong. The book's strongest passages are those in which Herman gives an overview of historical developments  the passage of racial separation laws in South Africa, for instance, when Gandhi was living there  and then lays out in great detail each man's response to those events. Best of all are the instances when each man reflected on the other; Gandhi admired how Churchill handled the war in Europe against the Nazis, even while bemoaning Churchill's dismissive attitude toward Indian aspirations for independence. Churchill's thoughts on Gandhi  at least those Herman touches on  tend to be less admiring. The nadir of the book as serious history comes on page 305, when Herman imagines a scene in Churchill's home, leading into it with the caveat, "It is very likely that on at least one evening in the 1920s, the conversation at Chartwell turned to the subject of the strange little Indian nationalist leader, with George Lloyd passing on his advice as he stroked his trim mustache ...". But from that point on, the imaginary conversation is written as history, albeit with an asterisk leading to a footnote that reads, "Although what follows is reconstruction, every word is George Lloyd's verbatim and is in the historical record." Well, no, it is most certainly not reconstruction, because the author admits he doesn't know whether it really happened! It is, in fact, what most people would call fiction. Fortunately, there is no more of that sort of devious nonsense in the book, but even one such instance is one too many in a book presented as history. "Gandhi & Churchill" is an interesting, entertaining read, but one that's tough to take seriously. Given the voluminous amount of information available on both Gandhi and Churchill, a book tracing their dual history as it related to India was a near-genius concept. That it was so seriously undermined through pop psychology analysis is a shame.